Ralph B. Brackett has been President & CEO of D&L for almost 60 years. He joined D&L in 1957 after graduating from Evans Business College and serving our country in the United States Air Force. 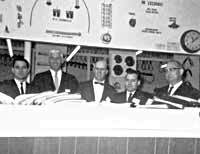 In 1960 Ralph Brackett became president of D&L. D&L began in June 1955 housed in a small building on Wilkinson Blvd. in Charlotte, North Carolina. In December of that same year Clyde Brackett (father of Ralph) bought out the original owners Dellinger & Link. At that time, D&L only had two employees. Shortly thereafter, Ralph went on the road as an outside salesperson and its third employee. By 1960 the business had grown to the point of needing more space so D&L moved to 708 S. Mint Street in Charlotte. D&L's first branch in Greensboro opened in 1961 and was followed with the Raleigh branch in 1964. Then in 1964, Ralph purchased D&L from his father. Today there are 18 locations in North and South Carolina. At the time Ralph joined D&L, it was selling mainly parts for wringer washers and ranges and other non-original parts. When original appliance manufacturers (such as GE, Whirlpool, and Frigidaire) approached D&L, it became an authorized parts distributor for almost every appliance manufacturer in the country. By 1977 D&L's growth necessitated moving into its corporate headquarters and Charlotte branch at our current location, 2100 Freedom Drive, Charlotte, NC. Its continued growth demanded the purchase of a 60,000 foot distribution / warehouse next door. In the early 1980's D&L was able to expand into the HVAC business when General Electric appointed us an authorized distributor for their residential heating and air conditioning equipment (The Trane Company later purchased the General Electric residential division). Since that time D&L has consistently been one of Trane's largest residential and light commercial parts distributors in the country. We are continually expanding our HVAC offerings to the point that we now represent over 250 vendors giving us the ability to supply almost any part the HVAC customer needs. Some of the HVAC lines we represent are Trane, ServiceFirst, American Standard, Alco, Bristol, Emerson, Furnas, Haier, Honeywell, Marathon Electric, Ranco, Rayovac, RefTec, Robinair, Steveco, Tecumseh, White-Rodgers, Goodman and many more. We pride ourselves on being a one-stop shopping facility for all our customers.